Join us at the next meeting of the New Jersey Corporate Philanthropy Network, where we will hear from René Deida, Senior Program Director, Integrated Strategies at Prudential who will talk to the Network about how Prudential invests, trains, and places its employees on Boards of nonprofits. The Council of New Jersey Grantmakers is proud to launch a new affinity group – the NJ Corporate Philanthropy Network (NJCPN). This first meeting will feature a fabulous speaker on a highly relevant topic – benchmarking. Maximizing Corporate Community Investments (MCCI) is a comprehensive and cutting-edge 9-part module curriculum over three days on corporate giving designed for small to medium-sized corporate giving programs. Join your corporate colleagues responsible for community relations, employee volunteering and grantmaking from throughout South Jersey for networking, a facilitated conversation, and help us design future meetings. A new pilot study from The Conference Board and the Impact Genome Project® (IGP) introduces standardized social outcomes to help measure and compare the performance of societal investments. 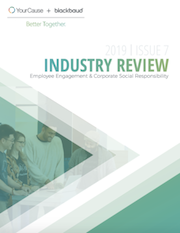 Twice a year, the YourCause team publishes an Industry Review focused on evaluating employee engagement and corporate social responsibility programs. This issue focuses on performance data collected and consolidated from the YourCause Employee Engagement platform, CSRconnect, between January and December of 2018. 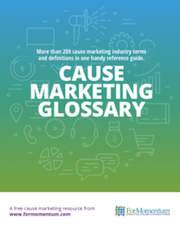 This handy reference tool contains the definitions for over 250 cause marketing industry terms used by savvy businesses and nonprofit organizations. It’s well established that employee engagement, defined as a willingness to do more than the job minimally requires, drives corporate performance. This report examines one potential driver of employee engagement - corporate volunteering, defined as employer-organized opportunities for employees to support a charitable cause or otherwise make a positive social impact with their contribution of time. This report explores how companies are integrating diversity and inclusion into their corporate citizenship and responsibility priorities. With support from the Walmart Foundation, CECP led a year-long inquiry to identify and share actionable insights and best practices that corporate leaders can learn from and apply in their own companies. The report identifies six key D&I trends, as well as case studies, latest knowledge, methods, and valuable insights.